My first (food) love is sushi. My second (food) love is a sandwich. It’s a beautiful thing, really. Totally flexible yet wholly satisfying and comforting. Sandwiches can be cold, hot, both, crunchy, mushy, gooey, spicy, tangy, sweet, open, closed, stacked, dainty, behemoth, you name it. I love me a Good Sandwich. Oh, but a little business before I go on about my love affair with The Sandwich. Thank you to the person(s) who nominated this blog for the Death by Chocolate competition on Culinate. I am flattered, to say the least. Unfortunately, because of my treatment, I am unable to travel and feel it isn’t appropriate for me to enter. Not to mention, the entries are by some of my absolute favorite food bloggers like: Peabody, Bea, Helene, Anita, Jaden, and Meeta… just to name a few! I encourage you all to go and look, drool, and vote. I’ll admit that I’m not much a sweet sandwich fan. I will take salty over sweet any day. Despite my love of making sweets, I don’t dig on them too much. Take a taste for quality control, distribute. But once I make a beautiful sandwich, I’m not as magnanimous as all that. I covet a good sandwich be it grilled cheese, a BLT (the B, the B! ), roasted eggplant, cucumber, Philly cheese steak, In-n-Out Burger (oh yes, ohhhhh yes), Green Bomber, Oporto, Chicken Diablo… The list is frighteningly and delightfully long. The beauty of the sandwich is how remarkably versatile it is, like no other. The Reuben is one of my favorite sandwiches. Although traditionally prepared with rye bread, I can’t help but substitute some good old sourdough because we rarely ever have rye bread on hand in our house and neither of us is a huge fan. But rye aside, this time around I had a corned beef brisket instead of sliced deli meat in the fridge. I should have shredded the brisket while it was hot, but wound up slicing and chopping it when it was cold. 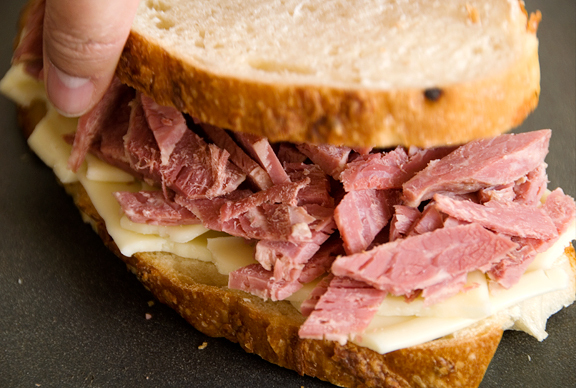 I really love piling thinly sliced deli corned beef on a sandwich, but I have to avoid deli meats for a while. 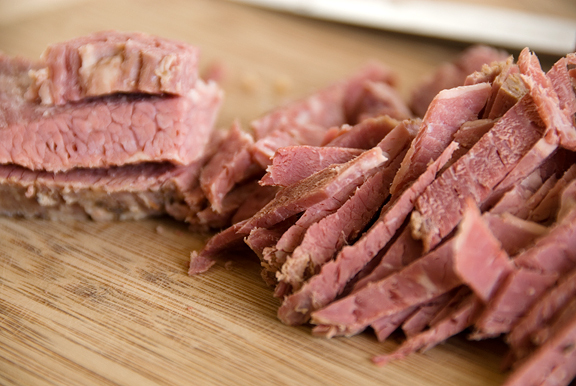 The point is… start with some good corned beef. 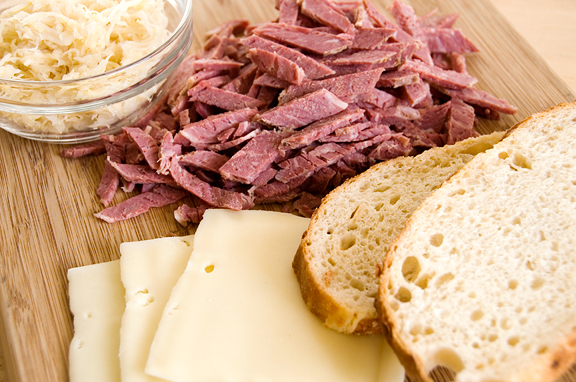 Round up some bread, Swiss cheese, sauerkraut, Russian dressing, and butter to accompany the corned beef. I like to squeeze out the sauerkraut otherwise I wind up with a super soggy sammy and that makes for a sad lunch. Now, to do it right, you’ve got to butter the bread. I typically butter the outside face because my waistline doesn’t really need the inside face buttered too. Ha – that’s your healthy step right there. Set the buttered face down on a pan over medium heat. Layer cheese, corned beef, and then set the other slice, buttered side out, on top. You want the bread to turn golden and the cheese to melt at the same time. High heat will burn your bread before the cheese has begun to melt, so just be patient. Flip the sandwich and cook until the other side achieves the same golden crunchiness. Watch it carefully, it gets there much faster than the first side. Some folks like to dump a pile of sauerkraut on the pan and dry it out or brown it up. I can go either way there. This time I removed the sandwich from the pan and dressed it with sauerkraut and Russian dressing. I prefer to slice my Reuben into two or three sections. It helps control the amount of oozage from the dressing and feels like I’m eating multiple small sandwiches, which is a concept that elicits great joy for me. Butter the outside faces of the bread. Heat a pan over medium flame. Set a slice of bread buttered-side down on the pan. Layer with cheese and then corned beef. Set the other slice on top, buttered-side up. Monitor that the cheese melts at the same rate that the bread turns golden and crisp. Flip the sandwich and brown the other side. Remove from heat. Open the sandwich meat-side. Layer sauerkraut and dressing. Close sandwich, slice. Serve. 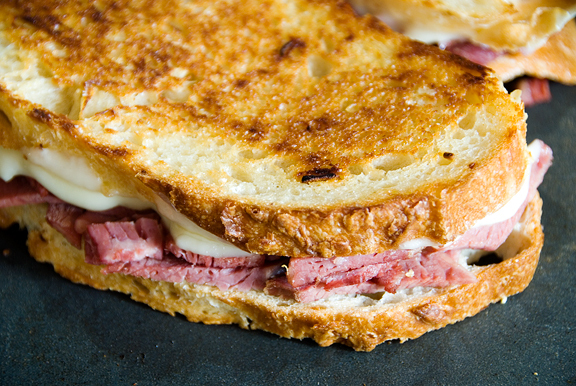 That looks so yummy…I want a rueben for dinner tonight now! One of my favorite sandwiches! And thanks for not saying “sammies” or “samiches”. I do love me a good sandwich. i can’t remember the last time I had a real Reuben Sandwich that looked this tasty! The first sandwich I had when I landed in the US was at a NY deli and it was a Reuben! It has been my favorite ever since….You make me hungry again and I just had dinner! I keep thinking about you everyday Jen and wish that everything gets easier as the days go by. Keep strong. 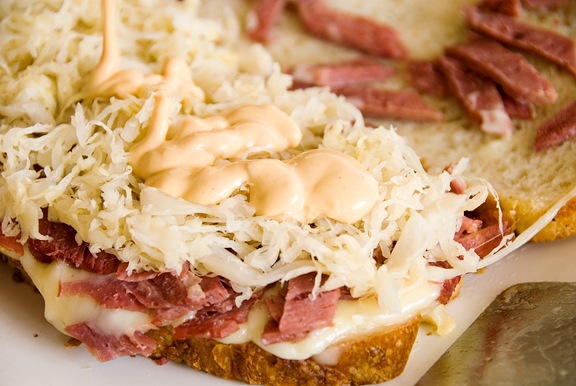 That reuben sandwich looks so good!! OMG, those sandwiches are decadent! Extremely tempting and scrumptious! I don’t think I’ve ever actually seen a recipe for a Reuben spelled out, but I’ve not had lunch yet, and I wasn’t going to have it, but now I find I have to go get a sandwich… Great looking sandwich! This is exactly how I make mine. So good! Dear Jen, glad to hear your tastebuds are a little better. We’re all rooting for you! SGCC – Yeah, the Russian dressing isn’t always available and sometimes I have to use 1000 Island. Thanks sweetie. Vicki – yum, your sandwich sounds great! When I can stomach spicy foods again, I will certainly give that one a try! Rosa – thank you, love. Curt – yeah, sandwiches don’t lend themselves to recipes because they seem like such no brainers :) I hope you found one! 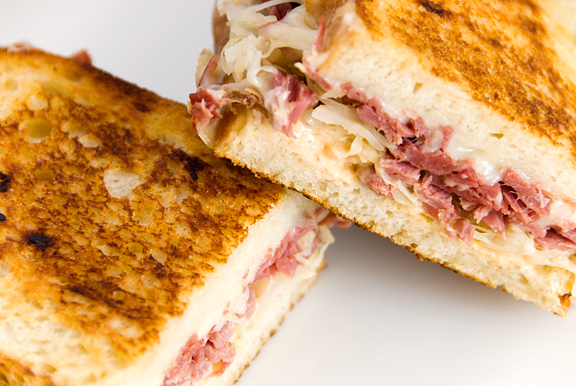 Reubens are my favorite, but it can be difficult to find one with tender meat. Luckily, there’s a deli here in town that makes a mile-high reuben with tender meat that is to die for. I always order it. And, this past summer, when I was vacationing in southern Oregon, I ran into a fellow who makes his own pastrami and corned beef. Now, that reuben was a treat as well. I’ll keep thinking good thoughts for you. Judy – a mile high?!?! *squeal* That sounds SO GOOD :) thanks for your good thoughts!! I think this sandwich is a classic. Whenever I check out a new deli, this is always a sandwich that I want to try. Your sandwich looks scrumptous. I look forward to trying your recipe very soon!